End of May i will be heading North instead of East! i will be flying to the remote island of Svalbard, 600 miles north of Norway. Svalbard is the gateway to the North pole. 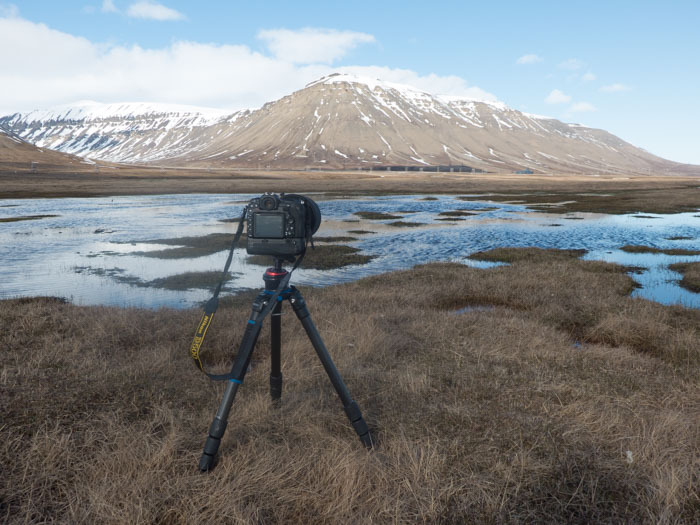 Early June is the perfect time of the year to photograph birds at Svalbard. The birds are all in their prime , displaying and approachable. I hope to photograph Phalaropes, Skua’s, Purple sandpipers and various duck species. 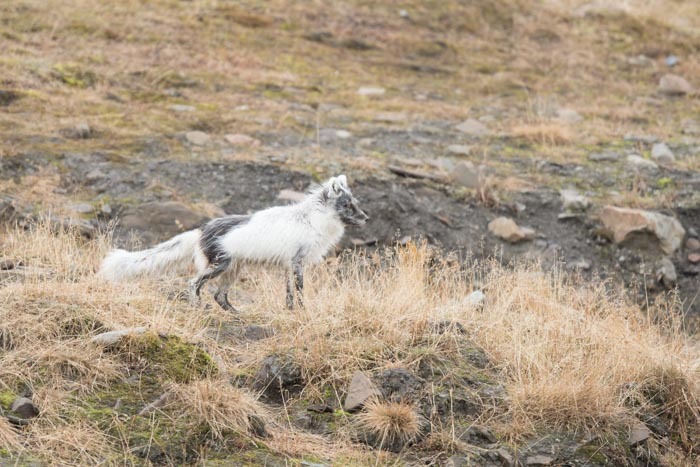 The Arctic fox is a good possibility as well and not to mention the fantastic landscapes. 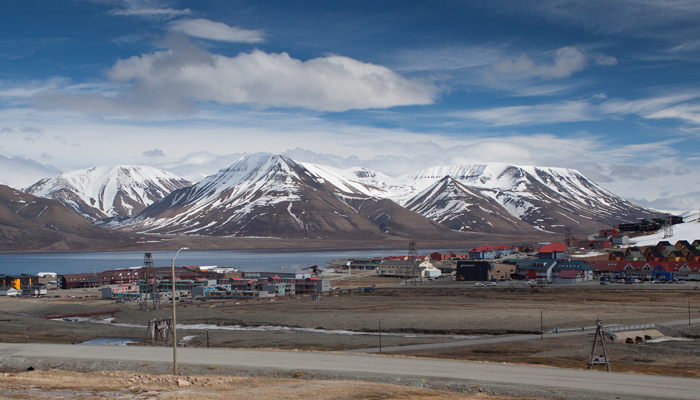 I will be staying in Longyearben, the capital of Svalbard. Around 2000 people live there and it is the most northerly inhabited village on this planet. Svalbard also has a hugh Polar bear population. Currently around 3000 bears roam the island but they are mainly confined to the northern and eastern part of the island. 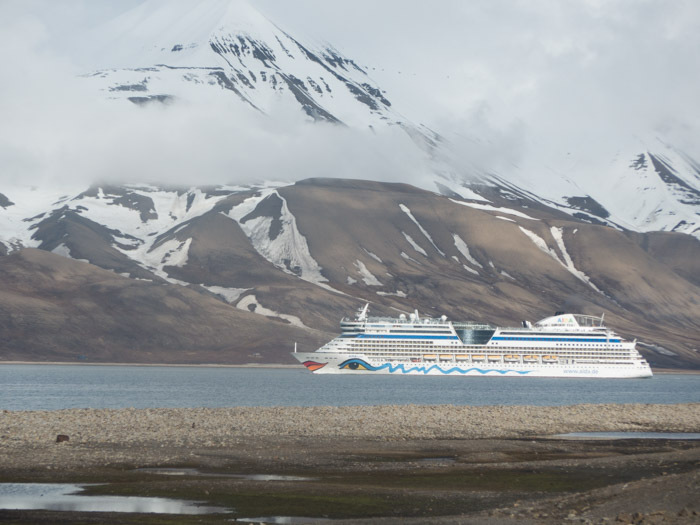 Sometimes they move closer to Longyearben. Apparently a rifle is a MUST, once you leave the village boundaries. The weather can be anything from sunny,to snowy to windy. Temperatures vary from just below to just above freezing. It is quite a trek to get to Svalbard. I will depart from Gatwick on the 29th of May, overnight in Oslo followed by a 3 hour flight to Svalbard. I have rented a car for the first 2 days as i will be on my own but later on in the week i will be joined by a small group of photographers who have been spending a week sailing around the island. As always i will be updating my diary on a daily basis. There is time enough as we will have 24 hours of daylight to look forward to! My final trip of the year started yesterday with a cab taking me to Gatwick and not to Heathrow for a change! A very civil time to leave home (mid afternoon) and in no time was i settling down next to some very noisy teenagers in Gatwick South terminal, waiting for my flight with Norwegian to Oslo. My first experience with Norwegian and they were not off to a very good start! A delay of 1 1/2 hour, no sandwiches when the trolley hit row 10 (i was in row 11) and the icing on the cake; we couldn’t disembark the plane when we arrived in Oslo because the jetty was too low for the plane! I arrived at the airport hotel late that evening. Dropped my bags in my room and when downstairs for a quick beer. You drink your beer in Norway very very slowly…why? Because it is bloody expensive! £8 for a glass of local brew! By midnight i returned to my room, had a shower and closed my eyes. Up at 06.00, a quick breakfast and an hour later i was back at the terminal. Checked in and went straight to the gate. The flight to Longyearbyen was as goo as full. It is a very popular destination for cruises around the island. This time the flight was full of Americans and i was sitting next to a guy from San Francisco, going on his first Arctic experience. The flight took around 3 hours and when we descended through the clouds, the landscape was just awesome! 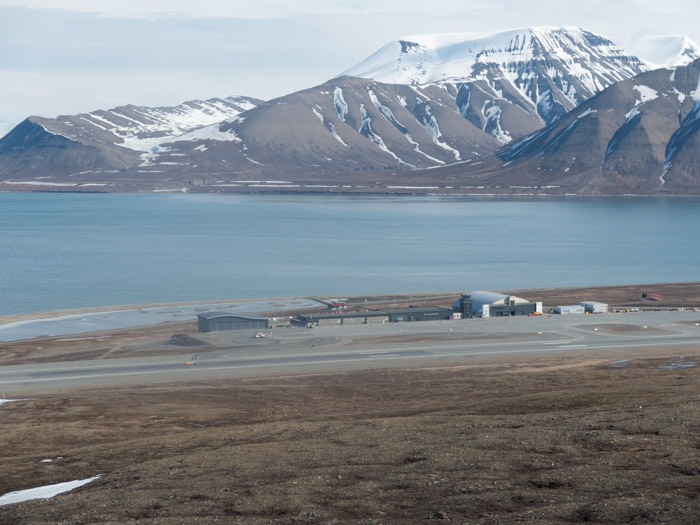 left and right snow capped mountains and the approach to Longyearbyen airstrip is through mountains either side of the plane. I recall reading somewhere that this airport is in the top 20 of most dangerous airports to land! The weather was beautiful and as i look outside of my room: the sun is still shining and will not set! In fact i could go out at midnight again for some photography! 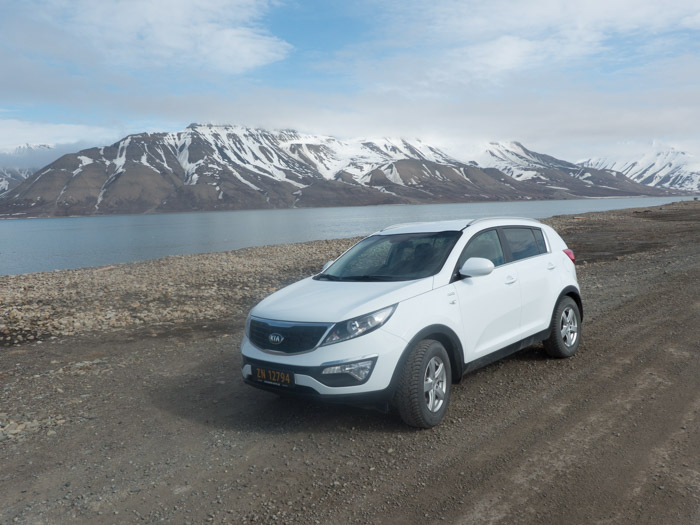 Anyway: i picked up my rental Kia and drove to downtown Longyearbyen. Rendeer, Longtailed ducks, Skua and Arctic terns everywhere. My room wasn’t ready, so i hit the local Co-op for some basic food supplies, had a drive around to see where good spots were for some photography. There is only one road and it stretches for around 35 km. So basically you would be photographing from the road. A rifle is mandatory outside the boundaries of the village but i opted for some Knackerbrot instead, i am sure a bear would be distracted by the smell and taste of this lovely cracker! I finally checked in my room and went straight out again to see if i could get a bit creative. There were several Long-tailed skua’s but they were a bit too far away for decent images. 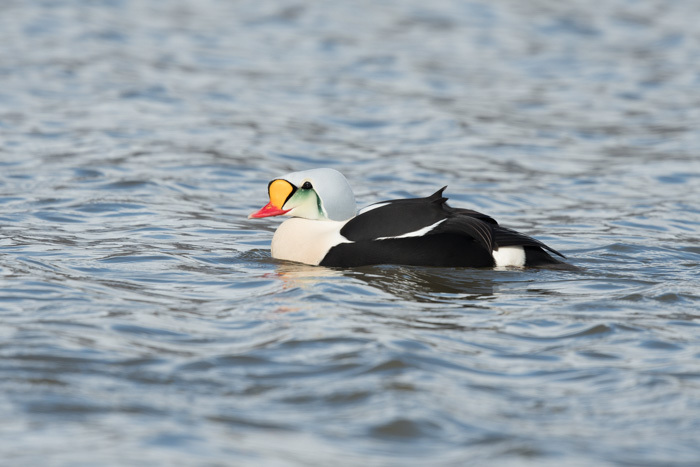 I found a small lake and there were several King eiders displaying as well as Long-tailed duck and Red throated diver. There are definitely plenty of opportunities here but when compared with the recent trip to Hungary: here you really need to get to the birds! The rendeer look great as well and i managed to photograph some nice individuals against the sun, working their way through some shallow ponds. There is still plenty snow around but spring has definitely started here. Birds are singing everywhere, oh and before i forget: Snowbunting as common as Sparrows! On the way back i stopped at the dog kennels. A large number of Eider ducks breed here as they feel safe but the many Eiders attract the Arctic fox and regularly they will stop by to steal some eggs. Despite me standing there for an hour, no fox showed up. I called it a day and returned to the hotel for a meal and to write my intro! It is truly a spectacular part of our world and i am sure i will return with some nice images (hopefully the weather stays good!). Who knows: i might pop out at 3 in the morning….after all i have 24 hours daylight! I decided to drive up to the beach opposite the airport. A small dirt road takes you along the shore and past the camping ground. It is a very good area for Arctic tern, waders and Arctic skua. 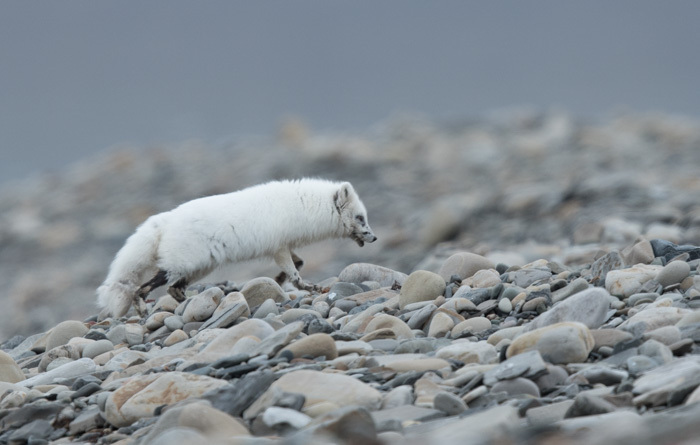 When i passed the pebble beach i caught a glimpse of something white with 4 legs….Arctic fox! I quickly drove a bit further guessing the fox would be following the shoreline and indeed i could see it coming towards me. It was not alone! There were in fact 2 foxes. One still in its winter outfit, the other molding into the summer suit! I stayed with them for a while. They did not come too close but i was still able to get some images of the 2 foxes, playing and running around! What a nice encounter! Hopefully i will have some more opportunities later on in the week. The weather is a bit poor. rather cloudy and a spot of rain but it should improve during the week, so i have been told. Spring has come rather late to Svalbard. hence why there are fewer resident birds. Yes there are Purple sandpipers, plenty of Snow buntings but the number of ,for example, King eiders and Arctic terns is still rather low. No small flowers erupting from the Tundra either! If one thinks of going to Svalbard and come back with thousands of images: you will be disappointed. (i know one person that would be VERY disappointed! :-). You very much need to search for your birds. A totally different approach then for example Hungary. 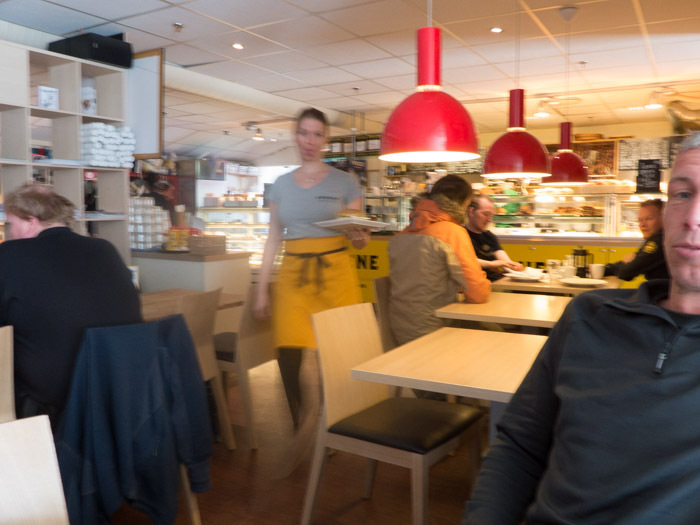 Mid day i decided to return to the lively city of Longyearbyen to get myself a coffee, have a rest and write up how the day has developed so far! Later on this afternoon i will go back out again. I am also waiting for the weather to get a bit better. Oh by the way; i have also discovered the most northerly Thai restaurant in Europe! Might give it a go this week. Out again later in the afternoon. The weather is still unsettled and from time to time it rains a bit. Strangely the other side of the estuary is in full sunshine! I head for the pebble beach near the camping. This is the same place where i photographed the 2 Arctic foxes this morning. It seems that more birds are starting to arrive from the south. Far more Terns, Kittiwakes and Purple sandpipers. The light isn’t great to photograph birds on or near the water, so i turn my attention to 2 Arctic skua’s, who have decided to raid the terns from time to time. I notice that the success of their air raids is quite low. The birds are easy to approach and i am able to take some nice images but soon they fly off again, harassing the Arctic terns. 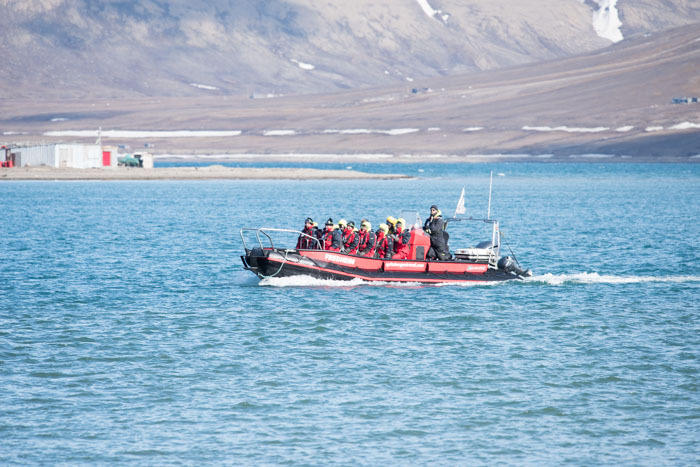 Tomorrow the other group will be arriving from their boat trip around Svalbard. I will meet up with them over breakfast and decide the plan of action and what we should concentrate on together with their tour leader. 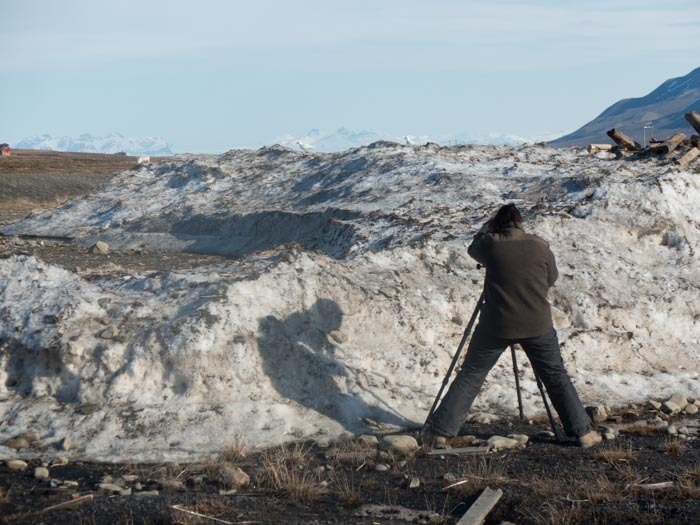 After all: i have now a bit more insight in the wildlife situation in and near Longyearbyen. I drive off to the small lake north of the village and there is a bit more action going on. Red throated diver have appeared, as well as Teal and much to my surprise a Tufted duck. I take some images but again the light is not what it should be and i decide to head back to the hotel for a cup of coffee and a rest. As i look outside, the weather is still dull, so i have decided to go for diner first and have a late evening session. I might try the most northerly Thai restaurant in the world this evening! I tried the Thai yesterday evening. A meal quick to forget…dreadful! Went back to the hotel, had a shower and was in bed early. Was out and about around 05.00. Looked outside and it was still drizzling! i was getting a bit frustrated by the weather but decided to go out anyway. I went again to the Camping ground (aka Pebble beach) but all was very quiet. I then decided to go to the small pond where the couple of Red Throated divers were and when i arrived the birds were still there together with some King and Common eiders. The light was just too poor to take any images, so i decided to watch and not release the shutter to avoid many images that would end up to be deleted! The Germans have landed! More human beings then Polar bears on Svalbard for one day! After a little while i decided to move back to the Camping ground and finally a bit more action. The Barnacle geese were fighting with each other and i managed some nice flight shots of the Long tailed skua’s. The pair of Arctic foxes were no where to be seen unfortunately (i did see one late yesterday evening at the dog kennels). At sea i could see a massive cruise ship making its way to Longyearbyen. It will be a busy day in the village i guess! The cruise ship had docked and more then 2000 Germans had flooded the village. For today there were more humans then Polar bears on the island! While i was filling the car with petrol i noticed a guy in a wheelchair, making his way ( i thought) to the village. Much to my surprise i met him again….6 kilometers further near the Red throated diver pond! I offered him a lift back. He told me he was working on the cruise ship and said i was the first one to offer him a lift back. I dropped him off near the local museum. Still no sign of the Dutch ship Ortelius. With it would be coming the few other photographers on this tour. They would accompany me for the rest of the week. I headed back again to the pebble beach and, in the meantime, the light had become very nice. 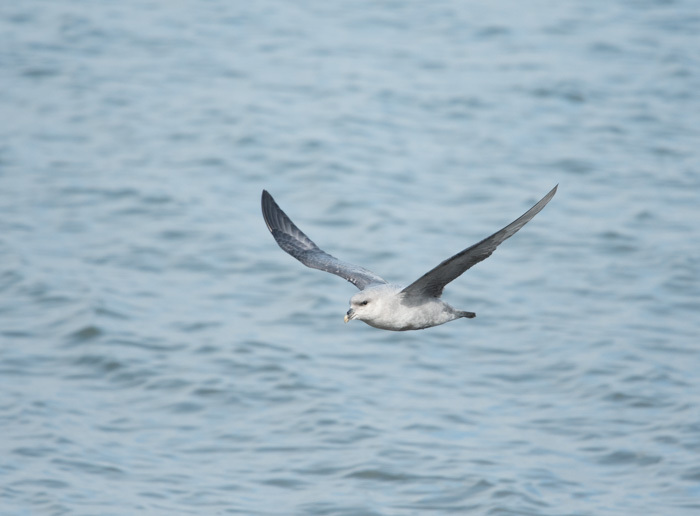 I also noticed far more Northern fulmars, including Blue phased ones. I positioned myself on the small beach and the birds came flying straight over me or low over the water. Great stuff! I also took some nice mages of flying Eider ducks. After a while my mobile phone went: Seraf van de Putten, the tour leader told me that they had arrived. I would meet up with them late this afternoon. I went back to the hotel to download my images and write my morning diary. Looking outside i can see the sun still shining and beckoning me to come out and play! I guess that’s what i will be doing! Stay in touch. Later today the afternoon news! So after my short afternoon break i headed back to the pebble beach. On my previous visits i noticed a small pond where a large number of Purple sandpipers were feeding and displaying. A good photographic opportunity or at least worth a try! When i arrived, i waved the German ship goodbye and then my attention was quickly drawn to the Sandpipers. I set up my tripod and mounted the 500 mm+converter on the Nikon D500. Slowly i approached the birds but they didn’t show any kind of fear. I sat down and watched the birds fighting, preening and displaying. Aufwiedersehn! The Polar bear has won! I took many images that afternoon and the birds looked great in their summer/breeding plumage. At times the birds were so close, that they walked just a meter away from me! 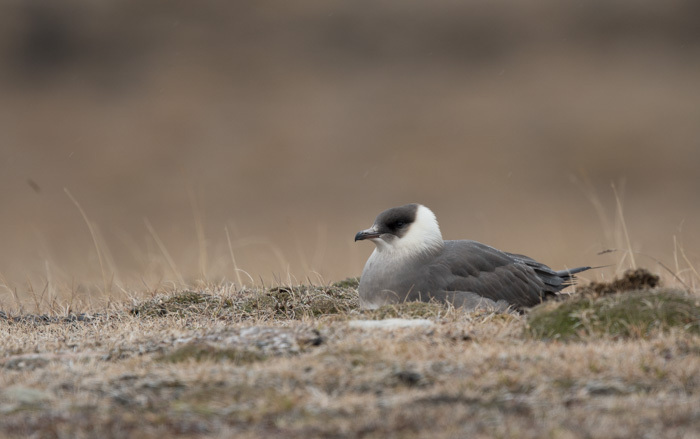 The Long-tailed skua’s were very active as well and were constantly marauding the Arctic terns. Suddenly my mobile went: it was Seraf, who was at the dog kennels with his tour group. I packed the equipment away and made my way to meet him and the Inezia group. It was nice to see Seraf. I hadn’t seen him for a long time! We discussed the plans for the week and i had already decided that i would keep my rental car. This way we could work from together and alert each other if we spotted something to photograph for the group. 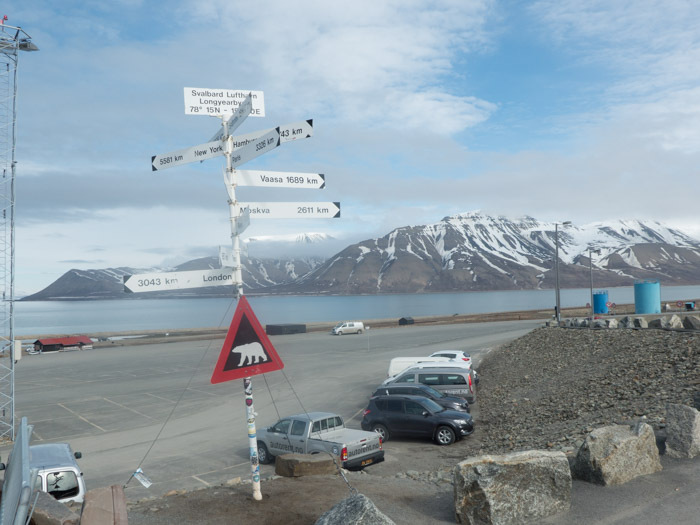 I decided to drive on towards the radar station, the highest accessible point of Svalbard. It gives great panoramic views of the country side. I drove back and stopped several times to take some landscape images and when i reached the dog kennels, Seraf was still there with his group. It was decided to go for a gourmet burger in the Coal miners inn. This was also the place where the tour members were staying. 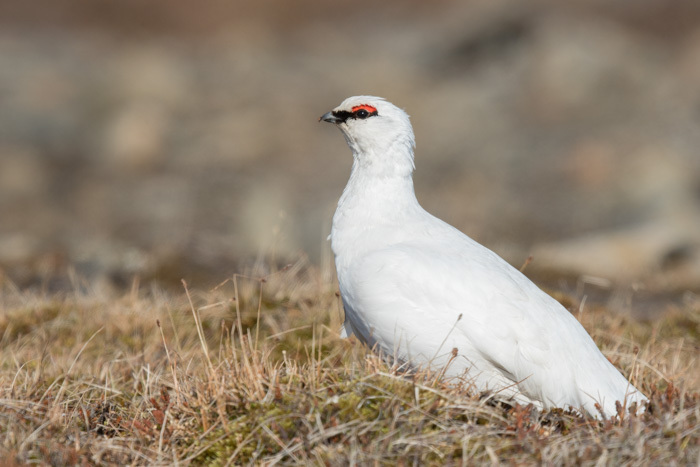 On the way down to the inn, we noticed a male and female Ptarmigan feeding by the side of the road! The icing on the cake of a fabulous day! I took some really nice images and later on i had my gourmet burger, which actually was very nice indeed! Out and about around 05.00. Weather was better then i expected. Cloudy but the sun showed at regular intervals. I decided to stop by at the dog kennels. Maybe the Arctic fox would show. Believe it or not, but by the time i arrived the fox was coming down the hill to rob the Eiders of their eggs. The fox returned 7 times at regular intervals and i was able to get some really nice images of the fox with an egg in its beak! A bit later i was joined by a Belgium couple who were photographing as well. It seemed they had spent already a whole week on the island. Arctic fox on the prawl for Eider duck eggs…with a lot of success! I moved further down to see what was happening in the small pond. Ahead of me i could see Seraf with his bus and guests making his way there as well. It was very quiet. The Red throated divers were there, a few Eider and one King eider duck, and that was about it. I decided to move to the Pebble beach to see what was happening there. It clearly is the most productive of the 3 locations. 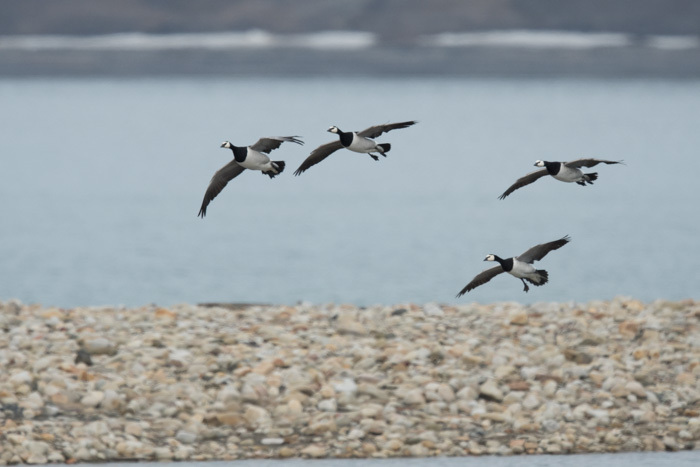 I photographed Arctic terns, Barnacle geese flying in with the snow capped mountains in the background. I even managed to photograph a Skua chase with a Kittiwake! I drove a little bit further and spotted a male Snow bunting singing its heart out on top of a small dwelling. I parked up behind the little house and much to my surprise the male and female bunting came down to sit on a pile of wood! How lucky can you get. i didn’t fancy photographing the buntings on the ground. The images become too 2 dimensional. Right i am going out again! The batteries are charged and i am ready for the afternoon session. 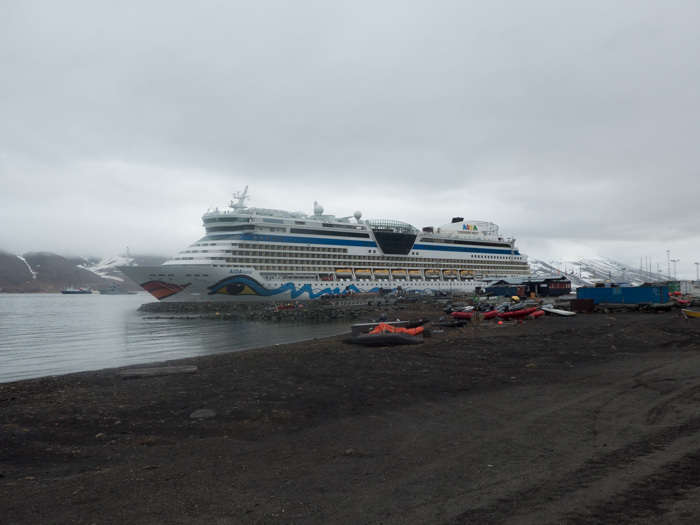 I drove off to the Pebble beach (i should call it by it’s real name: Longyearbyen camping….). I wanted to get some more images of the fighting Barnacle geese and some images of birds coming in to land with the snowy mountains in the background. Patience paid off! I took ample images of the Barnacle geese and also of birds coming in with the mountains in the background. I must have spent a good hour with them. I decided i would try the Purple sandpipers again but this time i would go very low down with the birds. When i parked up, i could see a number of Sandpipers feeding along the small pond (or should i call it puddle?). The birds are very approachable and i took with my my beanbag and ground pod. Lying flat on the ground i took some really nice images and as an added bonus; a very nice summer plumage Dunlin! 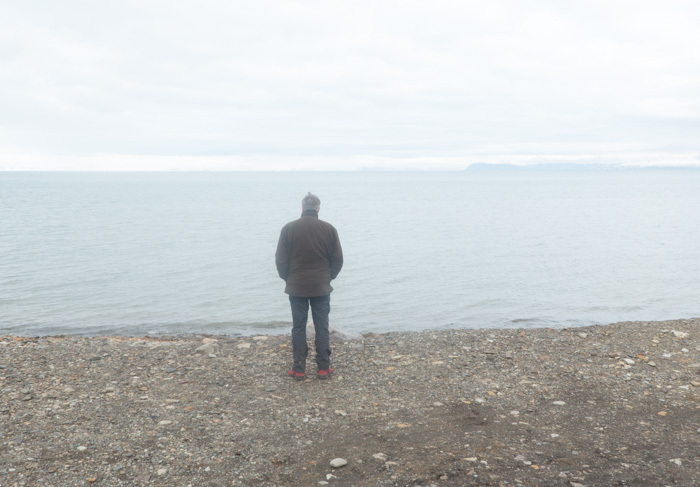 I decided to try my luck with the pond on the other side of Longyearbyen. When i drove up i noticed instantly a total lack of any kind of life! Parked a but further down was Seraf with his Inezia group photographing the specialty of Svalbard: Rendeer. They also didn’t find much else to photograph and they decided to try out a dirt track that ended near a derelict coal mine. I decided to turn around and have a look at the ringing station. There i saw a far distant Steller’s eider and spoke with a student from the university of Edinburgh who was doing research work on Svalbard. 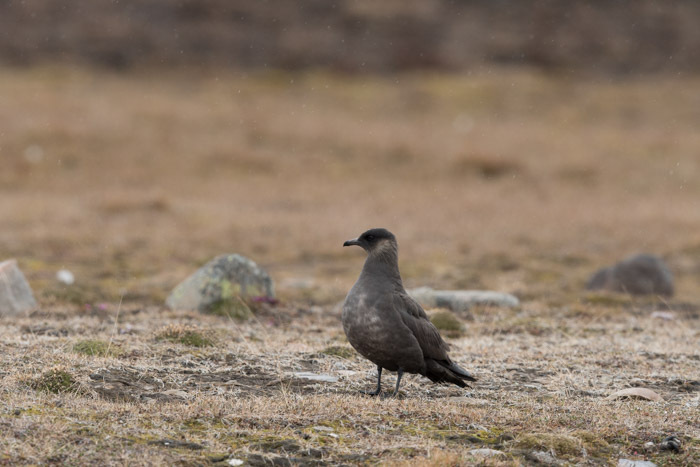 I also came across a dark phased Arctic skua, who was a willing model for me! He told me that the pack ice as retreated so fast that a large number of bears are stuck on the island! Rumors are that, give or take, 1000 Polar bears will have to try to survive in the far north and eastern part of Svalbard. 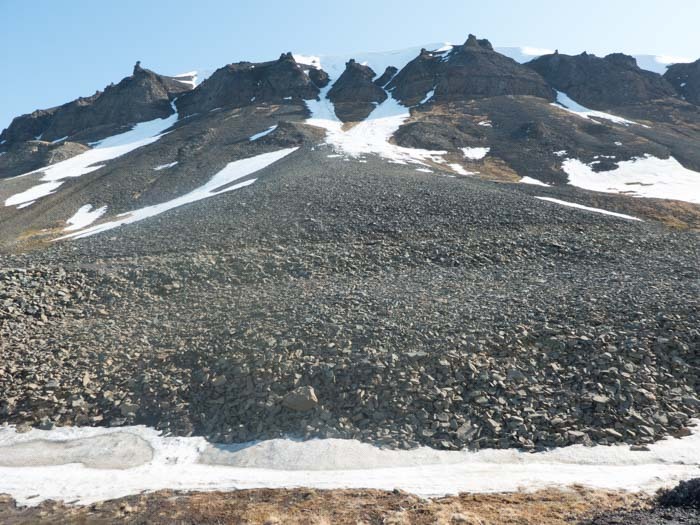 A hungry bear could try it’s luck down south: Lonyearbyen for example! I would point that bear towards the Thai restaurant! I drove back to the hotel to download my images and finalize my diary for today. Will be another early night! Tomorrow i will go to the dog kennel again early morning for the fox and then back to the Pebble beach! A glorious morning and i was out before 05.00. I went straight to the dog kennel to see if the Arctic fox would show. The Belgium couple was already there and the fox showed a number of times. It was constantly stealing the eggs from the Eider ducks. It would run op the hill, disappear and come back after a while to get another egg! I received a text message from Seraf that 2 Ivory gulls were seen at another dog kennel a bit further down. I decided to make my way to the kennel. The Belgium couple, who were departing Svalbard later today, decided to come with me. When i arrived at the kennel i discovered the 2 birds sitting on some snowy hills behind the kennel. 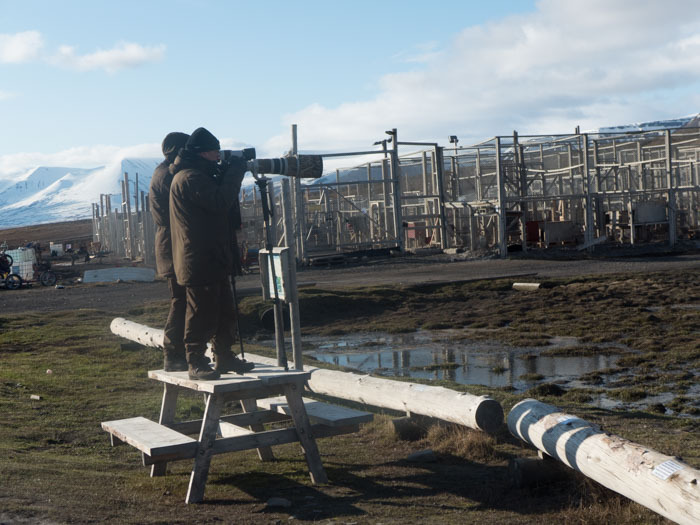 We parked up the car and managed to get really close to photograph these iconic bird of the Arctic. Sheer luck i call it! After a good half hour i left the Ivory gulls and made my way to the beach. I stopped at the pond but as usual it was very quiet, bar the Red throated diver who was now sitting on its nest! The Pebble beach was quiet as well but because of the spring weather the Barnacle geese were rather frisky! I took some nice images of mating Barnacle geese and also tried to photograph the Fulmars against the mountains back drop but was not as successful as earlier in the week! I filled up the Kia with petrol and drove back to the pond. No birds bar 2 Red-necked phalaropes! I parked up and as the bank is rather steep had to get really close to the water to get eye level with the birds! (Kevin/Paul…i didn’t fall in and got up by myself) I took some realy nice images of the birds coming straight at me! When i got up, Seraf was parked some meters behind me. They had been to the Radar station and told me that there were 3 Ptarmigan flying around. I drove up to the radar station but i was not able to localize the birds, so drove back to pebble beach. I made a stop ion the way at the Global vault. this is the place were all kinds of seeds are stored. From there you also have a beautiful view over the bay, airport , camping and Pebble beach. I also photographed a lovely male Ptarmigan near the top in its great white winter outfit! From there i made one last stop at pebble beach before heading to the hotel to charger the batteries and write the diary. All was quiet. Even the Purple sandpipers were not to be seen near the usual spot. All in all a fine morning. Hopefully later this afternoon some more pictures. I really love Svalbard. I suggested my wife that i could move here, her reply: on your own! This morning, while at the Pebble beach, i noticed a wader. Too small to be a Purple sandpiper. I tried to take a picture of it but it was straight into the sun, so decided to delete it from the CF card. This afternoon i got a SMS message from Seraf, who was at the Pebble beach with his group, telling me that they spotted a Yellow legged wader, a rarity! I am not one for twitching (in fact i am not a birder or twitcher! i am a nature photographer) but i did head for the Pebble beach, where i met the others. the bird was still there and upon closer examination by everyone, we came to the conclusion that it was a Wood sandpiper! Still very nice. Just as the days before i decided to crawl to the bird with a groundpod and beanbag. The bird wasn’t shy at all and i managed to get some nice images. After that i decided to move to the pond again to see if there was (finally) a bit more activity. First i checked the dog kennel for the Ivory gulls but unfortunately they were gone! The pond was kind of dry as well! Nothing special but on the other end of the pond i did see a Red phalarope. I decided to head back again to the Pebble beach. The Arctic terns were displaying and i spent some time with them. The local Skua’s were at it again and i tried hard to get the flying action in my viewfinder but all images were blurred. I think today i am calling an early night. i would like to be up again by 04.00. First stop will be again the Arctic fox at the dog kennel. Followed by the Pebble beach, the Pond and back again to the Pebble beach. On second thoughts: i go where the action is! Diner tonight in the Coalmine cabin. I had salmon yesterday and tonight i go for the steak. being outside makes me hungry! Up at 04.00 and headed straight for the Arctic fox. Weather was beautiful but there was a stiff wind blowing making it feel very cold! The fox showed a number of times and i took some images as well, but getting an image of the fox with and egg was difficult, as it always turned its head the wrong way! By 05.00 the Inezia group with their tour leader Seraf arrived and all were happy to see and photograph this egg stealing fox. I drove a bit further and noticed another fox coming along the road with an egg in its beak. It was running parallel to the car and me and i managed some nice images bar a little bit into the light! Unfortunately some photographers have no manners! I report them to the Svalbard tourist office! The group was heading for a zodiac boat trip but i decided to stay on shore and try my luck near the pond again. First things first; i headed back to the hotel for breakfast and, for the first time, this trip, added extra layers to keep warm! Today was also a special day in Longyearbyen: the annual marathon took place. It must be the coldest and most northerly marathon in the world! I headed for the pond and, just as the last few days, no birds. I drove on and just after the pond on the right were a couple of small ponds and both Phalarope species were feeding there. I parked up the car and made my way towards the birds. The light was perfect and so were the birds; i photographed the Phalaropes mating twice in a perfect position! Happy days! I drove on to check for the Ivory gulls at the dog kennel on the right, past the pond. Both birds were resident again but sitting on a shed, so not worthwhile taking any images. Next stop: the Pebble beach. When i arrived i noticed a Zodiac making its way out to sea with waves breaking around it. in it; the inezia tour members in survival suits and freezing their a…s off! The Pebble beach was extremely quiet, so i headed back to the Dog kennel and met up with the Scottish student who was trying to photograph the foxes. Remember the image of the Wood sandpiper? It might not be one after all. The Scottish chap advised to check with the ringer in the ringing station. So i knocked on his door and he told me that Wood sandpiper is an autumn migrator. Later this afternoon i will visit him again with the laptop to get the bird finally identified! I drove to the harbor and met up with the returning Zodiac. Everyone seemed to have enjoyed it but for photography the zodiac trip (with this wind) is less suitable. Still a nice experience i suppose. the group headed to Longyearbyen for a sandwich and a coffee, while i drove back to the small pond for some more Phalarope images. I managed some nice images of the feeding Red-necked phalarope and a Dunlin having a bath. After that i headed back to the hotel to update the diary and recharge the batteries. I have noticed the Nikon D500 eats batteries and i just read that the old Nikon EN LR 15 batteries can be swapped for new ones at Nikon! This trip i also had the Nikon D810 with me, but i noticed that the Nikon D500 gets a lot more use, simply because you need the extra reach. Time to go out again! 1 1/2 day to go and i can honestly say: it has been a great trip with some nice images, beautuful scenery. Do not go here for a lot of species. 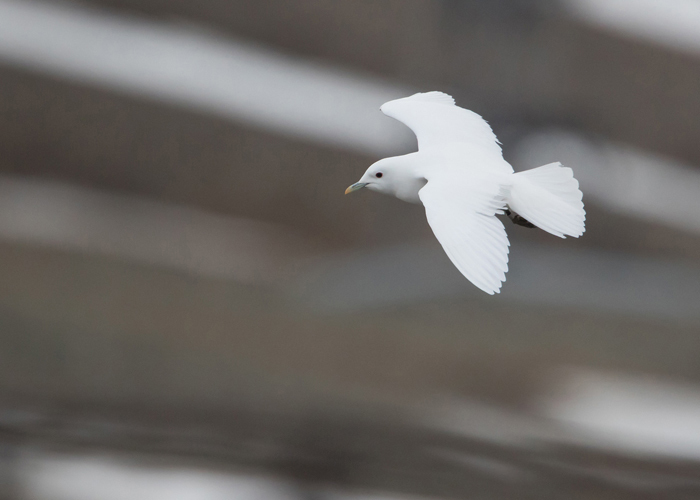 20+ species is all you get but the arctic experience and those 20+ birds will leave a lasting memory. I drove down to the small pond behind the pond with just the Red throated diver in it. Again i spotted the Red-necked phalaropes. The light was lovely, so i decided to get the 500 mm and D500 out. I didn’t take as many images when compared with this morning but i still got some nice shots! It is funny but being in Polar bear country does make you alert. I really stood up from time to time to check out the surroundings. I also thought: if the few Rendeer around me start running, i should get worried! 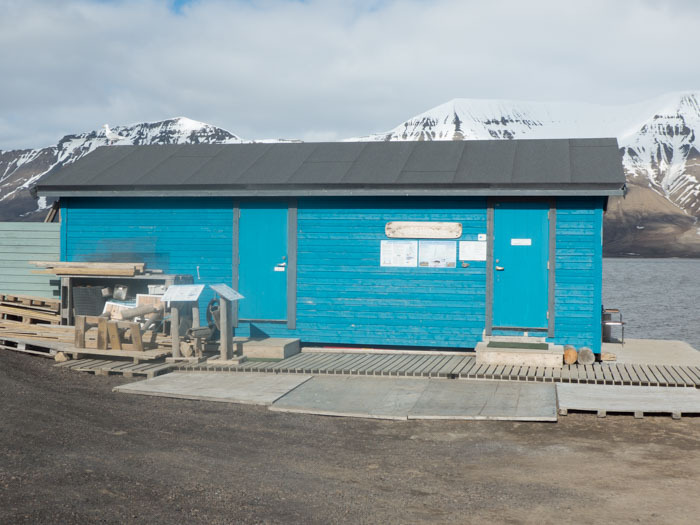 I went back to Longyearbyen and met the others for a cup of coffee. I also went to the ringing station and met up with the guy who rings the birds (mainly Purple sandpiper). I told him about the wader that was photographed by us earlier in the week and he suggested to get my laptop with the image of the bird. So back i went with the laptop and he was immediately on the phone with the bird specialist of Svalbard. Remember we thought it could be a Yellow legged sandpiper? 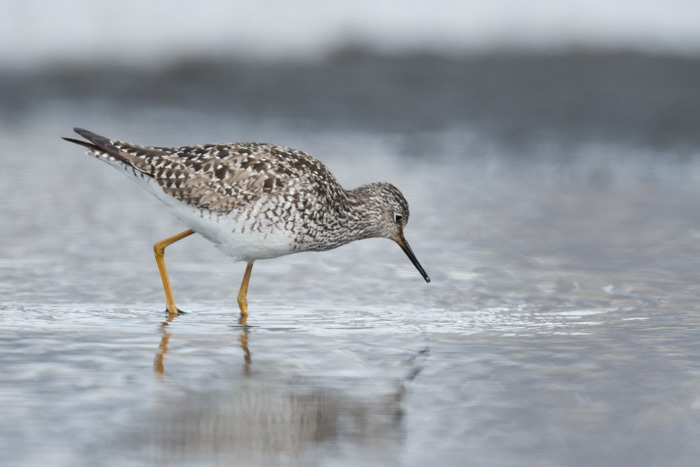 But at the end we went for Wood sandpiper…well the bird was identified as a Yellow legged sandpiper, a migrant from the USA, and a first for Svalbard! After informing the others of the news, i headed for the Pebble beach. I stayed there for a while but it was very quiet and to be honest my tank was running on empty as well! I drove one more time to the small ponds to check it all out but there was another photographer trying his luck with the Phalaropes. I decided to call it a day and went back to Hotel Spitsbergen. Maybe not the most productive afternoon but you can’t always expect that with this hobby anyway! Off to diner at 18.00 hours precise (that’s what the tour leader says) in the Coalminer’s cabin. Food there is great and i can recommend it if you ever want to go to Svalbard. Rather trendy as well! That’s it for today. Tomorrow the last full day before heading home on Monday. Another lovely morning and i was up by 04.30. I decided to go for the Arctic fox again at the dog kennel but this time i wanted to have a different kind of image: an image of the fox running passed me with an egg in its beak. Just after the kennel is a dirt track that runs behind the dog kennel up a slope. On top you can park the car and watch the fox either go down the hill to the kennel or come up from the kennel with an egg! At first i observed where the fox would show up. He or she was running quite far into to the distant hills. I noticed it coming back but the fox decided to have a nap. It stayed stationary for at least half an hour! All of a sudden it jumped up, run toward me, passed me and went down the hill to steal another egg. I jumped out of the car and positioned myself with the D500 and a 300mm lens, guessing where the fox would pop up. It pooped up at the ideal distance and i took a number of images of the fox with the egg and sun lighting up the scene from behind me! i was very pleased! I drove down further into Adventdalen. Photographed a nice Long-tailed duck . Checked the kennel for the Ivory gull, but it was no where to be seen. On the way back i was lucky to photograph a lovely Teal, not far from the road and the small pond had 2 Phalaropes swimming in it. The light was perfect and the water had a nice grey color from the mountain behind the pond. I took some really nice images of the Phalaropes before heading back to the hotel for breakfast. At 07.30 we all drove to the end of the dirt track near the airport to photograph Little auk. 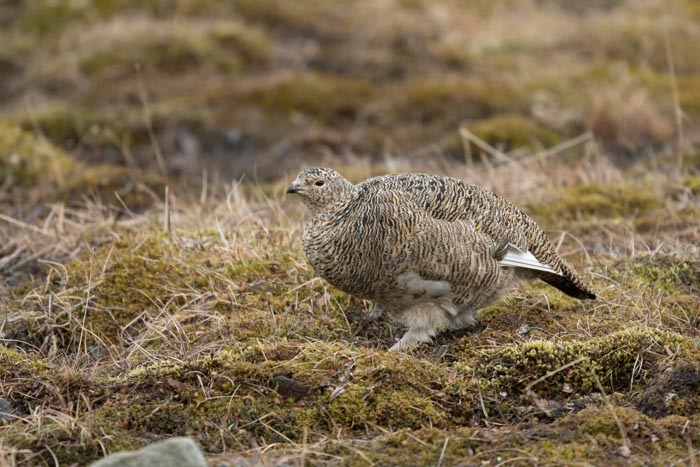 These birds breed on the slopes under loose stones. Getting eye level with these small birds was rather tricky as the loose rocks made moving around hazardous, but eventually i got myself in the right position! I took lovely images of these pretty little birds, even mating! I also tried my luck with flight shots but moreover then not it was out of focus , as these birds are extremely fast flyers. Persistence paid off at the end: I did manage to get some good images of the birds in flight. 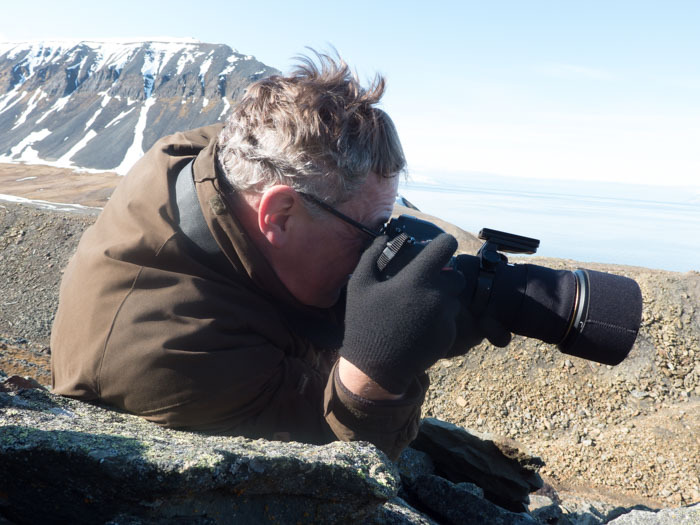 Me photographing Little auk and the spectacular scenery! No bears were spotted by the guard! We all drove back to the harbor to check for Black guillemot. There were a few birds and one was really close to the edge of the quay, allowing for some nice images ( i could get down a bit to get a better angle) After that it was time for a coffee in the local cafe. I opted for a nice Capucino and Salami roll, served by a lovely Dutch student Isolde Callisto. Who, like the birds, had decided to spend the summer in Longyearbyen. Not a bad place to be i suppose. Sorry Isolde, you are not in focus but the service was lovely! In the afternoon i did my same routine: driving from one end of the ONLY road on Svalbard to the other! All was a bit quiet to be honest. It seems the waders on Pebble beach had moved on to their breeding grounds, bar the Barnacle geese and the Arctic terns. I drove down to Adventdalen again to check out the little ponds. It was a bit busy there with a full bus load of Inezia photographers “harassing” the Phalaropes! I sure hope they got some nice images. 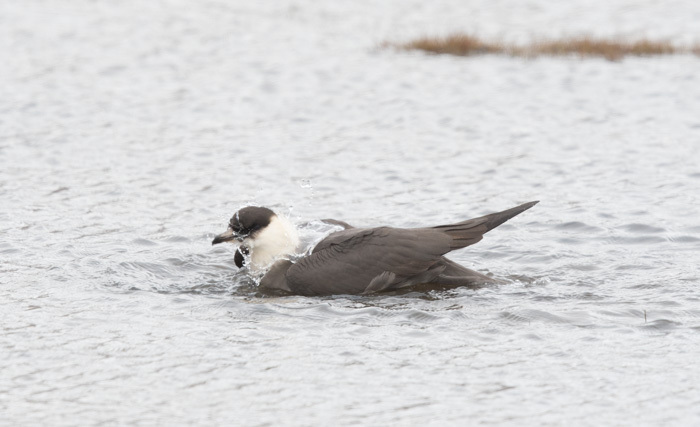 On the way back to Longyearbyen i noticed 2 Arctic skua’s having a bath by the side of the road. I stopped by and spent some time with these birds. Got some really nice images i think! Next stop was the ringing station to see if the warden was there but as it was still high tide, no one was there. (they set out the traps at low tide). By the way? 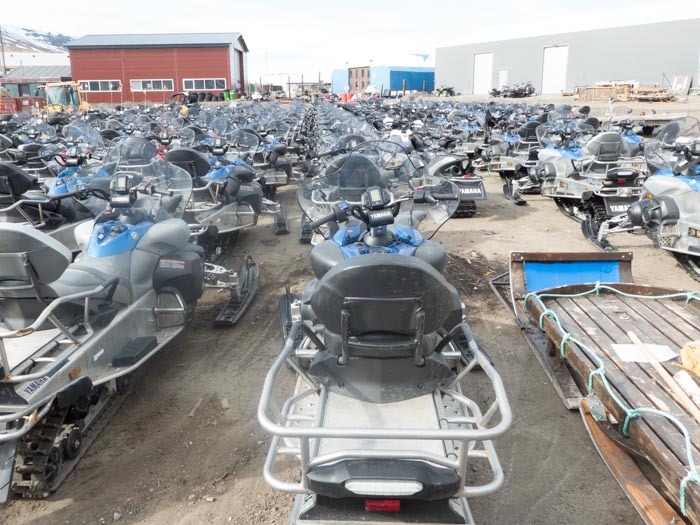 Did i mention the enormous amount of skidoo’s they have here in Longyearbyen? Unbelievable. i think there are more skidoo’s then human beings here! I hope you remembered where you parked the skidoo dear! Next stop (again) Pebble beach but as i said above: nothing happening there anymore. I decided to give it one last shot for this afternoon and drove back again to Adventdalen, but nothing of notice showed up. 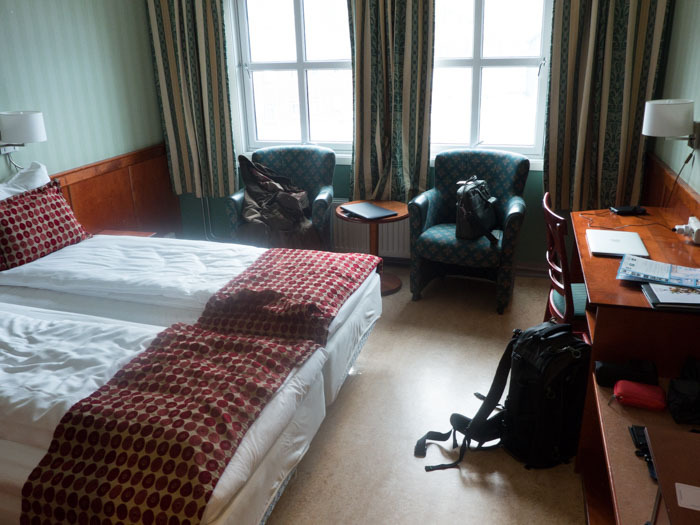 I decided, for once, to call it a day and went back to Hotel Spitsbergen. Ordered a beer, paid the bill and went to my room to relax and clear up a bit! Tomorrow morning one more session before catching the flight back to Oslo, followed by the flight to Gatwick. The final update has to wait till i am home. I hope you all liked the diary so far. All i can say is that i had a great week here. i was lucky with the weather and with the photographic opportunities. The other guests of the Inezai trip were all very nice but as i did my own thing, only saw them in the evening over diner and a beer! I hope they had an enjoyable tour as well! Yesterday evening we had our final meal in the Coal miner’s cabin. A nice burger with a beer, glass of Red wine and to top it off a nice Whiskey! (Thanks Onno). I was back in my hotel around 20.30, had a shower and went to bed. My idea was to give it one more shot before we would leave this fantastic island. However when i opened the curtains at 04.00, it was very much overcast. Decided there and then to go back to bed and get out a bit later. i think i deserved a bit of a rest anyway! 2 hours later i was on the road and when straight to the fox. Despite me posting on top of the small hill, the fox didn’t show and i decided to move on to the Ponds. All was very quiet and i decided to call it a day. Went back to the hotel and did my packing and finalize the final chapter of this diary! The trip was organized through Inezia tours in the Netherlands (www.ineziatours.nl). I opted to stay in a more comfortable hotel with private facilities. The Coal miners cabin have a great bar and is fantastic place to eat, but my understanding is, is that the rooms are basic with shared bathroom. Expect to pay around NOK 400-500 for a meal and about NOK 100 for a beer. There is a good supermarket as well. I stocked up with water, crackers, cheese etc, so i could stay out , taking pictures, for as long as possible! Of course you have 24 hours daylight this time of the year. Temperatures vary but are generally around freezing. The weather this week was very good. Maybe one day when it was very overcast but all other days were sunny and cloudy. Perfect conditions!Cloth wise: You are in the Arctic, so one should take winter cloth with him/her. layers, thermal underwear, boots etc. Equipment wise i used Nikon D500, Nikon D810 with a 500MMF4, 300MM/F4, 1.4 converter, 70-200 and 18-35. As well as tripod and ground pod. All been used extensively! Total cost for this week trip. Not cheap! £3000. i think it was absolutely worth it! I had a fantastic week, took many images and of course i was lucky as well. Thanks to the other tour members and Seraf for being the tour leader! If there are any other questions, drop me an email. Happy to help. I finally met up with the only Polar bear in the village! The end!